Have you ever heard someone mention "ET" and wondered what it meant? Assuming the person wasn’t talking about extra-terrestrials or Entertainment Tonight, the conversation was probably about evapotranspiration. Evapotranspiration (or "ET") is the water lost through plant transpiration and soil and plant evaporation. The images below help explain what ET is and how it occurs. Evapotranspiration (ET) is the combination of evaporation and transpiration. 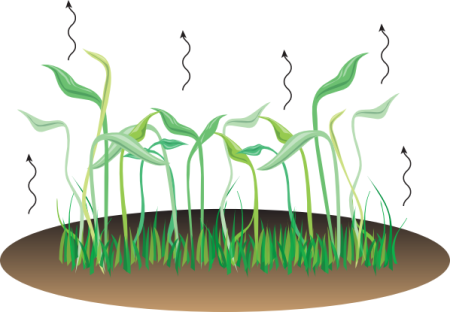 Evaporation is water movement from wet soil and leaf surfaces. Transpiration is water movement through the plant. This water movement helps move vital nutrients through the plant. 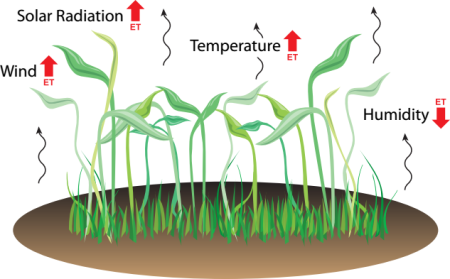 Evapotranspiration (ET) is an energy-driven process. ET increases with temperature, solar radiation, and wind. ET decreases with increasing humidity. So, how exactly is knowing the ET helpful? You can use ET to determine when and how much irrigation water is needed. A common use is with turf grass irrigation. As an example, if your irrigation system applies 0.5 inches of water during one irrigation event, with no rainfall and an ET loss value for 2 days in a row of 0.25 inches, you would need to irrigate after these 2 days. Note: Rain totals are not part of the Reference Evapotranspiration, and they should be compensated for as necessary. For example, a rain total of 0.15 inches in one day with an ET value of 0.25 inches for the same day would be a net loss of 0.10 inches. Solar Radiation – Constitutes up to 80% of the equation depending on conditions. Air Temperature – Ties for 2nd place with wind speed. Wind Speed – Ties for 2nd place with air temperature. Relative Humidity – Has a noticeable effect when the air is really dry or really humid. In addition to these weather measurements, you need the height of the wind speed sensor, as well as the latitude, longitude, and elevation of the site location. Tip: The site location of your weather station is very important. It is ideal to place your weather station in a location that is a good representation of the crop of interest. With turf grass, for example, your weather station should be surrounded by turf and located away from trees and buildings that can affect the wind and sun exposure experienced by the weather station sensors. Cd = denominator constant that changes with reference type and calculation time step (s m-1). Units for the 0.408 coefficient are m2 mm MJ-1. There are some smart irrigation controllers that can be used to automatically adjust the irrigation schedule based on the ET. The best controllers use accurate local weather information to produce the ET value to be used for irrigation scheduling. One example is the Weather Reach Controller Link. I hope this information has helped you understand the basics of ET. If you have comments or questions, feel free to share them. This blog article was updated to include example data for calculated ET.